ENNIS, Tex. 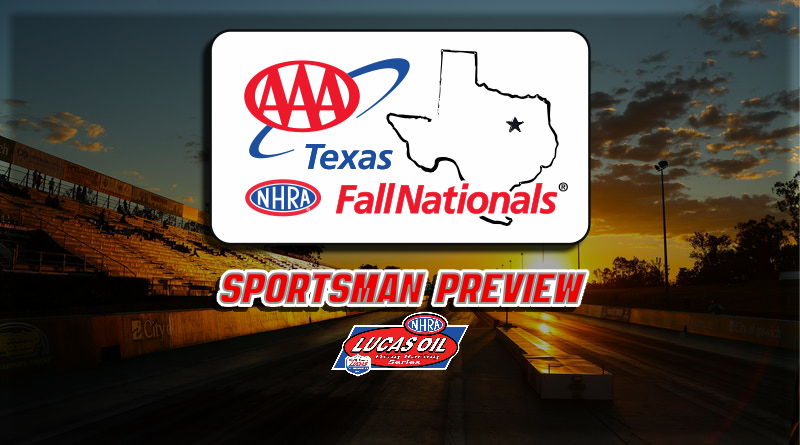 – Almost 400 of the best sportsman racers from across the Southwest are heading to the Texas Motorplex in Ennis, Texas this week for the AAA Texas NHRA Fall Nationals. Racers will be competing for points, monies, and trophies in a variety of classes including Competition Eliminator, Super Stock, Stock Eliminator, SAM Tech Factory Stock Showdown, Super Comp, Super Gas, Super Street, Top Dragster, and Top Sportsman. With each national event DragChamp’s sportsman preview includes an overview of the stories of each class along with the now famous DragChamp Picks. Beginning with the U.S. Nationals DragChamp has picked at least one of the sportsman winners in each of the last three NHRA national events. We’ll look to continue the trend this week as our picks are listed below. Thurday’s schedule includes a couple of time trials and qualifying hits for each class along Stock Eliminator class eliminations and also round one of eliminations for the Super Gas competitors. I don’t remember a time when Super Gas, or any other sportsman class, was scheduled to run first round on Thursday of an event other than maybe the U.S. Nationals. This the first year I will not be competing in Super Gas at the Dallas National in almost 20 years but if I were attending, I wouldn’t be happy about it. Racer’s must invest so much time and effort to get to these events, go through the parking process, credentials, etc. all to be potentially done by Thursday afternoon? I can’t imagine most racers would make the investments in their rigs, cars, time, and money to travel to a national for a one and done situation. Hopefully this does not start a trend for the NHRA going forward. Friday’s action includes one round of competition for the sportsman classes while Saturday is scheduled for 3-4 rounds of eliminations throughout the day. Sunday brings the Big Show as the semifinal and final rounds will be contested in between the Pro sessions. Follow DragChamp daily as we will provide recaps of all the action each day. Let’s recap the 2017 Event Winners before we get into the 2018 preview. 2018 Event Preview by Class. The story in Comp will be David Rampy gunning for national event win number 100. After collecting number 99 at the AAA Midwest Nationals a couple of weeks ago and picking up a LODRS win in Great Bend, Kan. last week, Rampy will look to ride a hot streak to number 100. Clark Smiley – The guy has the coolest Comp car around. It’s a Pro Stock style Pontiac GXP with blown small block engine. Just listening to it idle is a treat. The one to watch this week is Chris Chaney as he attempts to take over the national points lead from current leader and reigning world champ Justin Lamb. Chaney will need to win the race to take over the points lead. After a strong summer, Chris is definitely capable of winning the event. For a cool wheels-up video of Chaney’s recent win at Denver, click here. Slate Cummings – I going to stick with the defending event champ. Slate loves to drive the finish line and has won his share at the Motorplex. Jimmy “Cooter” Hidalgo – Cooter has been red-hot on the LODRS level with a near-double earlier in the month at South Georgia and a runner-up last week at Silver Dollar Raceway. He’s due for a national event win. Jeff Hefler – The former Stock Eliminator world champ practically owns the Texas Motorplex. He’s won everything there is to win at there. Brian McClanahan is making the long tow from California as he attempts to better a second round finish in order to gain points on leader Justin Lamb. Local favorite Jeff Lopez is also in the mix for the championship and will be adding full event points to his national tally. This field includes top racers from all over the country which makes selecting a winner extremely difficult. Jeff Lopez – The former world champ always comes up big when it’s all on the line. Jacob Pitt – Talented driver with good equipment that makes rounds everywhere. Jerry Emmons – The Lucas Brothers as my children call them are always a tough out at the Motorplex. Can anyone catch the Don Schumacher Racing Drag Pak Challengers in FSS? I don’t think so. Look for another beat down by Leah Prichett and Mark Pawuk this weekend. Notably absent for the second race in a row is Joe Welch. After his double disqualification at INDY, Welch has not attended another FSS event. You can read more about his disqualification here. Look for the Stanfield powered trio of Arthur Kohn, Steven Bell, and Aaron Stanfield to run a distant second to the DSR cars. Leah Prichett – No surprise here as Leah’s dominated the last two events. Unlike Pawuk’s car, Leah has the most consistent and second quickest car in the class. She also drives it like she stole it. I’m sticking with a winner here. The 70 car Super Comp field is literally a murderer’s row of talented racers. The event list includes multi-time world champs Gary Stinnett, “The King” Edmond Richardson, and Austin Williams along with Tommy Phillips, the Collier Family racing team, and even Greg Stanfield trying his hand at index racing. Mark Grame and Don Nichols will be counting every point as they are both locked into the national championship points battle. Both are looking to knock Chris Garretson out of the top spot this weekend. Steve Collier – After suffering a devastating Top Alcohol Dragster crash earlier this year, Big Steve is back in action and I look for him to start collecting win lights quickly. Tommy Phillips – This is almost unfair as Tommy has won more nationals at Dallas than probably anyone. Almost a sure thing. Taryn Greene – Taryn tends to make tons of rounds at every Division 4 event. Could be a breakout weekend. While there are no national points implications on the line in Super Gas, a couple of top 10 ranked players will look to improve their tally at Ennis as Tim Nicholson, Mr. Reverse Throttle Stop, and Casey Plaizier will try to improve their scores in order to contend for the championship. Tommy Phillips – See Super Comp! Nuff said. Tim Nicholson – The 100 mph, 4-speed, manually shifted ’67 Camaro has been red-hot lately and I’m sticking with the hot hand. Val Harmon – Tough racer with great equipment spells a winner to me. We don’t get a lot of Super Street at the nationals so this one will be interesting. Luckily I’m from Division 4 so I’m familiar with most of the racers. Cole Cummings – He’s been killing it everywhere lately, definitely due to break through. Gary Stinnett – By far the most accomplished and knowledgeable racer in the class this weekend, should make rounds. Ray Dew – One of the baddest Super Street racers in Division 4 over the last decade. The story in Top Sportsman this week is JR Lobner. JR is only six points out of first place in the national points chase. All JR needs to do is turn on two win lights to take over first place. We’ll see if he can get it done, if not, he’ll face some windshield time as he’ll need to travel to have another chance to add to his national event total. JR Lobner – I think JR gets it done this weekend and takes over the championship race. Lance Rutland – Talented racer that makes tons of rounds. Daniel Leibham – Talented young racer that drives a Mopar powered Camaro with if I remember correctly a Lenco transmission. There was a lot of pre-race talk about a record bump at St. Louis which was thwarted due to weather issues but looking at the entry list for Dallas, I think the bump will be interesting to watch as there are a number of fast cars from all over the country heading to Dallas. The other story of the weekend will involve Mark Jones as he attempts to chase down Paul Nero in the national points race. Jones will need to win the event to keep his hopes alive. Aaron Stanfield – Super-talented young driver who can drive the wheels off of anything. Danny Nelson – The chassis builder can not only build cars, he knows how to get’em down the track as well. Jeff Koron – Talented Division 5 racer is always a threat to win. Visit DragChamp daily for more sportsman class racing updates from the AAA Texas NHRA Fall Nationals. DragChamp is your online source for NHRA sportsman racing news and drag race results.